Darren graduated from University College Dublin in 2015. During his degree, he developed a strong interest in Internal Medicine, Neurology and Emergency and Critical Care. Having completed a 1-year rotating internship, Darren decided to pursue specialisation in Internal Medicine. 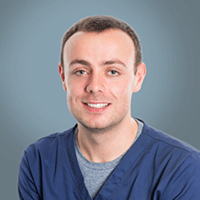 While interested in all aspects of companion animal medicine, his particular interests include haematology, endocrinology and emergency and critical care medicine. Levetiracetam monotherapy for treatment of structural epilepsy in dogs: 19 cases (2010-2015) (2017) Kelly D, Raimondi F, Shihab N. Veterinary Record. Gallbladder Agenesis in a Dog: Clinicopathological, Histopathology and Computed Tomography Findings (2017) Kelly D, Moreno B, Lamb V. Journal of the American Animal Hospital Association.